Storybook setting on this lovely home and beautiful Acreage, close to town and 1-80 for your easy commute. Looking for a lovely location look no more, this is it! All flat usable land with Creek frontage for a truly beautiful setting. Home IS 2, 780 SQFT has been tastefully Updated with New Paint, Carpet, Laminate and Granite. Wonderful Floor plan. Cottage 500 ST FT off garage is a full 1 BD/1 BA, Family room, Kitchen Dining Room and Laundry. Darling! This property is loaded with charm. Downstairs 1 BD/1 BA and Great Room, 3 BD upstairs and Family, Kitchen, Dining Main Level, Solar and Tankless Water Heater. This Unique home is tucked away on a quiet, private, Lane. 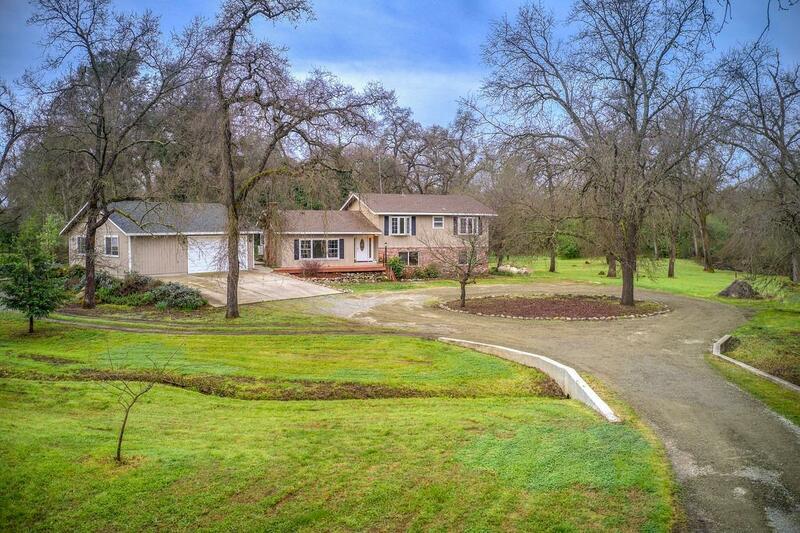 Small Creek wanders thru right rear of property creating a majestic setting, offers flat usable frontage. Paddock used for chickens, could easily add arena, Stable, etc if desired for horses. Come take a peek and fall in love with this adorable home, all Move-In ready. Perfect In-Law set up or 2 families MUST SEE FLOORPLAN.